Scientists are trying to unravel what's happening in your brain when you feel the urge to snack like crazy late at night. In a small study published in the journal Brain Imaging and Behavior, researchers from Brigham Young University used an MRI to measure how people's brains respond to different types of food images at different times of the day. Fifteen healthy women viewed a total of 360 images, once in the morning and a day later in the evening, over two separate occasions. Subjects looked at images of low-calorie foods such as vegetables, fruits, and fish, and as high-calorie foods like ice cream, candy, and fast food. All participants showed greater neural responses in their MRIs when looking at images of high-calorie foods. However, the evening scans showed a lower response to both types of food pictures in areas of the brain that measure rewards. "In the evening, reward pathways are showing a reduction," the lead author of the study, Travis Masterson, told CBS News. "Food is not as appealing, but people keep eating because they're trying to get that same high or same satisfaction from eating food that they get during the day." Masterson said the effect is similar to other addictions where people are compelled to gamble or drink or use drugs because they are seeking a particular high, even if they don't necessarily want to engage in the compulsion. Participants in the study were told to avoid eating for a number of hours before each MRI session. Although they maintained the same diet on all days of the study, they also said that they were more preoccupied with thoughts of food in the evening and believed that they could eat more. "They should have been less hungry at night because the fasting period was shorter," Masterson said. "We know that there is something going on here." 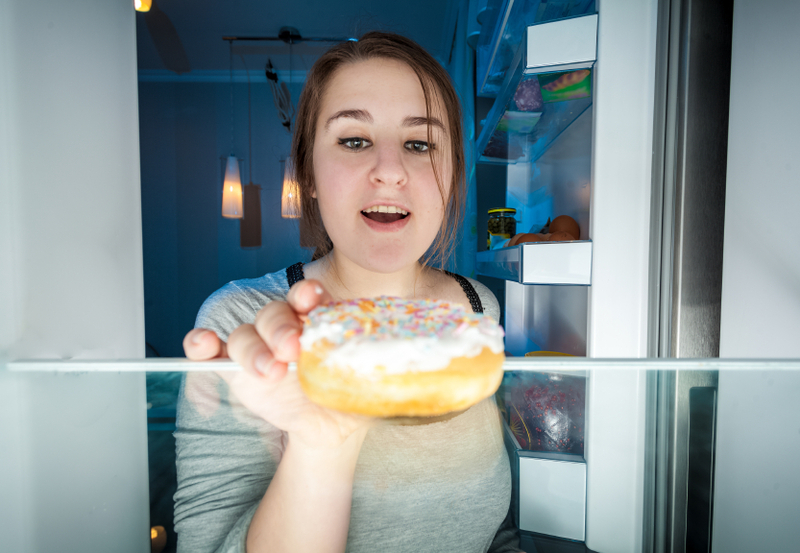 For people who want to reduce or stop their late-night snacking, Masterson offers this advice: "Pay attention to how much food and advertisements you're seeing in the morning and remember that things aren't as satisfying at night." "Paying attention to your environment and how it's affecting you is the first step in making a behavior change," he said. Masterson plans to continue his research by studying how exercise can lower the visual response to food in children.